Ahh yes. Still the most popular green building myth of them all. And probably one of the most common concerns we hear from our clients who are considering going green: "...isn't it going to cost more?" To claim that a green building costs more, is no more accurate than claiming that a sports car costs more than an SUV. It all depends on what kind of a car you want. Are you wanting the super-turbo-charged-titanium-reinforced-hard-top-convertible with the ruby-studded shift knob? Well yeah, OK- that one's probably going to cost you more. A growing body of research continues to show however, that there is no statistically significant cost difference between green-certified projects (such as the LEED Green Building Rating System), and non-green certified projects. My 20+ years of experience as a sustainable architect has tended to validate this data . Most of the important energy-efficient features that any self-respecting green architect should consider first, are items that don't cost anything more up front. They're simply what I'd call basic, common-sense design. These include such considerations like how the building is oriented on its site and where the windows are located. Have the roof overhangs been properly placed and designed? Are the windows appropriately sized, with correctly specified glazing for each exposure? Are there deciduous trees nearby that can be used to both control and take advantage of the sun? While each of these considerations can greatly affect the overall performance and comfort of a building, none of these are design items that cost a penny more. For those green building features that do cost more up front, overall cost savings can still be achieved through creative, informed design decisions regarding just how and where that added investment is made, and what other building systems can be reduced or eliminated as a result. This is known as "cost shifting." Cost Shifting can function as an investment strategy (like putting money in the bank used to be), where greater dividends are earned over time, on top of the initial investment amount. Planned carefully, these savings can add up substantially. 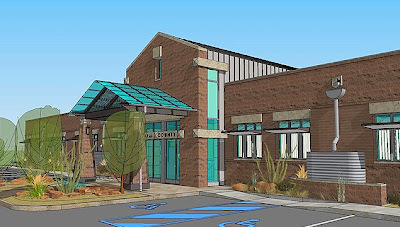 For a hypothetical 18,000 square foot Community Center building for example, if we were to specify a high-performance double-glazed window system costing $10,000 more to install than a more conventional window system, savings are realized when that investment allows us to cut eight additional tons of refrigerant cooling, and 75,000 BTU's of additional heating from the construction scope that would otherwise be needed. The reduced heating and cooling plant size would save roughly $5,000 right out of the box. With the reduced operations and maintenance cost for the mechanical equipment that we didn't need (at a savings of ~$3,000 per year) we'd achieve what's known as "payback" in about 2.5 years, saving an additional $3,000 each year after that, year in and year out, for the duration of the building's life. Over an arbitrary 30-year period, that would add up to around $90,000 net worth of savings- and that doesn't even account for the generally rising costs of energy, or the life-cycle replacement cost savings for mechanical equipment that was never installed. As you can see, while perhaps costing a bit more up front, with the right choices it doesn't take long to achieve a net-gain ROI (return on investment), which can easily exceed the initial added expense. In the Community Center example above, shifting costs from the building's heating and cooling systems to a better quality window package, yields a more energy-efficient building, with a significant cost savings for the owner over time. This only makes good economic sense. Though typically overlooked, sustainability in general and green design in particular must also take into account the large amounts of "human" energy that also goes into any building project. In my own business practice, we consider our client's financial resources to be a vital form of this energy- and every bit as worthy of conserving, as the material and energy resources that the building will need. To address this notion of "our client's finances" as being a critical project resource, we've developed a unique process called "Value Optimization". 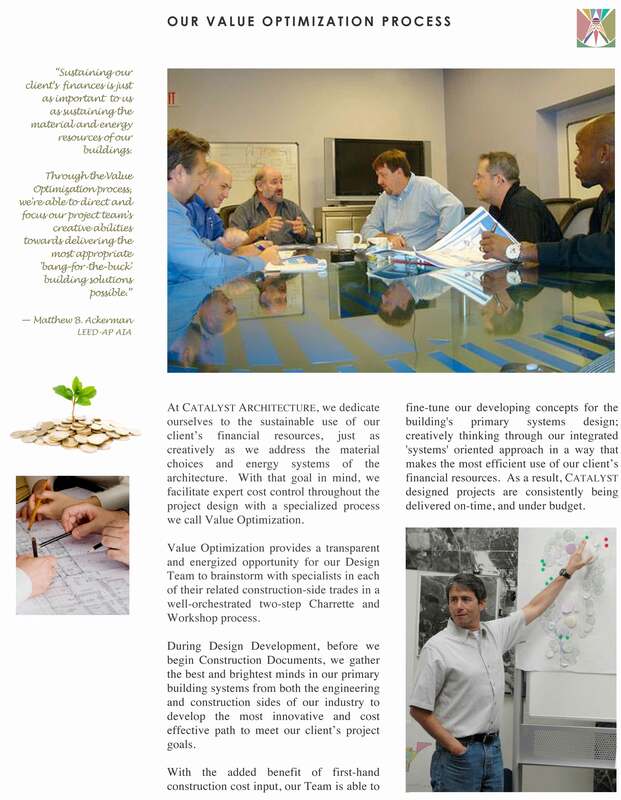 With Value Optimization (in contrast to Value Engineering), we pair up our design-side engineers (representing the major building trades- architectural, mechanical, structural, civil, etc. ), in an intense two-step workshop environment, with their build-side counterparts (representing the same building trades), in an effort to creatively brainstorm on how to best construct the approved design- and for the least amount of money. Our Value Optimization process has consistently trimmed 10 to 15 percent from our initial construction cost estimates, and for less than half the cost of traditional Value Engineering. It's become a proven win-win-win process for our entire project team. Using this innovative cost control method, our company has brought in each of our last three significantly sized projects well under budget - including the new County Administration building, which is currently under construction out on Commerce Drive . On this particular design, ALL 16 of the qualifying construction bids came in under the County's $5M budget cap. This is an excellent example what can be achieved when the best of our industry's creative capabilities is applied to the task of conserving and sustaining our client's green-building construction dollars. Building green doesn't have to cost more. In fact, my own experience continues to demonstrate that going green usually ends up costing less. Value Optimization: How Does It Work?